I have been on a flourless cookie kick lately. These cinnamon pecan cookies are my latest creation. These flourless cinnamon pecan cookies are so good and they have no added sugar! Yep. These delicious cookies are sweetened only with dates! I made a caramel out of the dates and it was so good. The recipe is similar to my flourless salted caramel chocolate chip cookies and my toasted coconut caramel cookies. If you like the taste of pecan pie, then you will like these little cookies. This recipe makes a small batch so you don’t have to worry about having a lot of extra cookies in the house. These cookies are vegan, gluten free, grain free and paleo friendly. All you need is 3 ingredient to make this sweet treat with no added sugar! Drain the water the dates were soaking in. In a food processor , combine all the ingredients and mix until a dough starts to form. 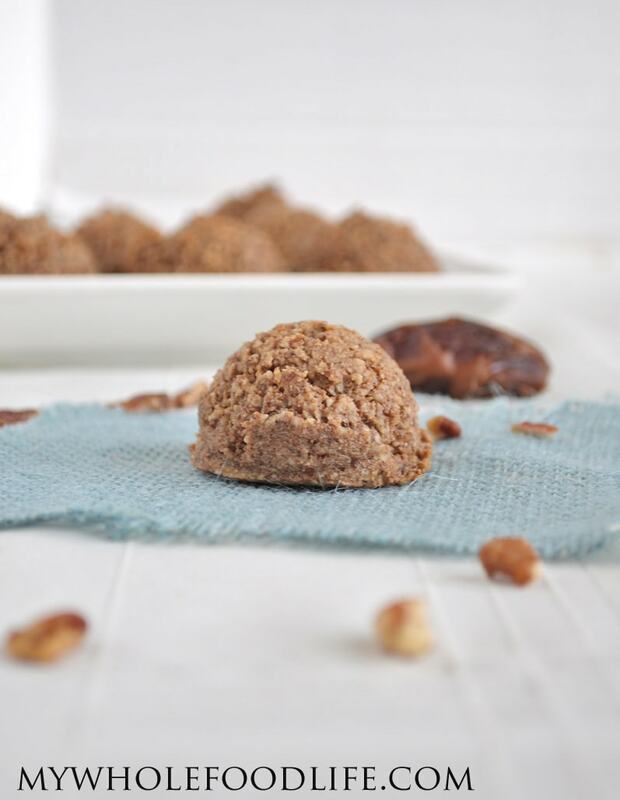 Using a cookie scoop , form into balls and place on a lined baking sheet. Wait until the cookies have completely cooled before removing them from the baking sheet . Store these cookies in an airtight container in the fridge. They should last a couple weeks that way. You can also freeze them for longer storage. Enjoy! These look great! Do you also add the water that the dates were soaking in? Or just the dates? Thank you! No. Drain the water. I just made these and they are really good! I always love a little apple with nuts and cinnamon, so I added some dried apple, too. Thanks for another great (and super easy!) recipe! You're welcome! Great idea to add the apple! I love healthy desserts. I'm allergic to pecans, so I'm going to try these with almonds. Thanks for the recipe! Curious, what is the reason for the raw pecans? What happens if you use roasted pecans? I'm new to the natural, flourless world. So I want to thank you for helping me as I experiment with such simple and delicious recipes! I'm enjoying the wonderful flavors of foods I've never thought to use before. I love these little treats. I added a bit of coconut chips and they are amazing! Keep the recipes coming! Much appreciation! I'm just eating a warm, fresh-from-the-oven cookie now. These are SO delicious! Thank you so much for these simple recipes, Melissa. It's nice to be able to bake in the middle of the day with two toddlers running around. Do you think the recipe would work well as-is with pumpkin seeds for my nut free baby or would it be too dry? You are so welcome! I imagine the recipe could work with pumpkin seeds. Sunflower seeds too. What about cashews? And adding a bit of sugar to the top to make it taste like snicker doodles? Awesome! I hope you enjoy this one too! I made these the other night, they weren't sweet enough for my tastes so I added some honey on top afterwards, they were so good!!! It seriously tasted like pecan pie!! Ate the whole batch over the course of 2 days. Whoops. Definitely going to make these again but adding honey into the dough from the beginning. I just had two of these and they are *incredible*!! I only had half the amount of pecans on hand, so I rounded things out with walnuts and they were delicious. There seems to be endless opportunities for combinations of different nuts and add-ins: coconut, apple, goji berries, cacao nibs. Thank you so much for sharing this recipe! You're welcome Jess! Glad you liked them! I love your recipes! They are always so tasty! Can't wait to try this--we love pecans! Thank you for your creative recipe...ingenious!!! I printed out the recipe and calculated the calories for the 2 cups of pecans AND calories in 10 dates....came up with a total of 2191 calories for the dough of 10 cookies; this makes each cookie approx 219 calories each!! There has got to be a way to decrease that number but still keep the same volume and same number of cookies....got any creative ideas and how to do that??? I look forward to your ideas : ) Thanks again for such a delicious recipe!! I don't count calories, so I had no idea. They are so rich that I only eat one in a sitting anyway. :) You may be able to decrease the amount of dates and increase the pecans to cut the calories down a bit for you?